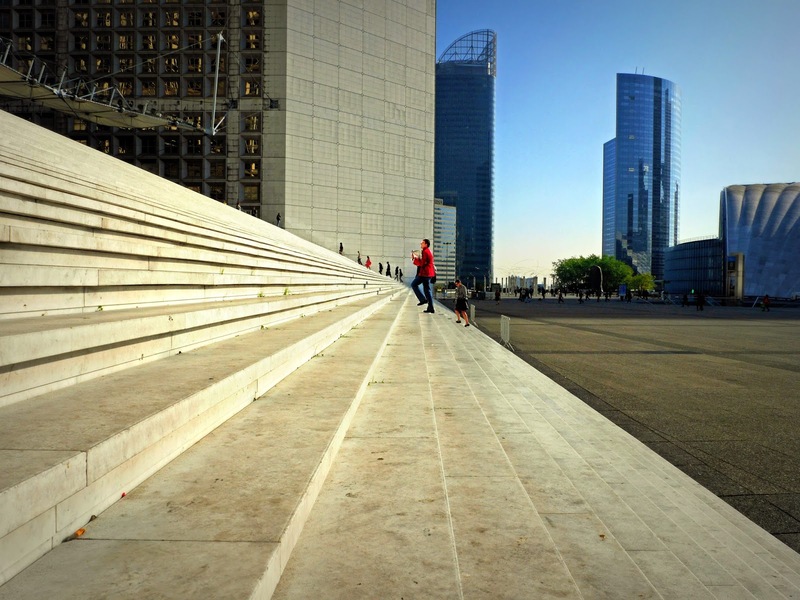 A few days ago I did a "micro trottoir" (vox populi in English) at La Défense, the business district just outside of Paris. I had to get the people to explain - in front of a video camera - how they manage to protect their private life from the professional intrusion caused by mobile phones and email. It was pretty hard because no one wanted to talk (they were probably afraid to be recognized by their boss!Anyway, when I finally finished, I managed to get a few good interview clips and... take this gorgeous photo from the side of the Grande Arche as a bonus! Good perspective shot, Eric. Very dramatic from this angle. Oooh, this is one of those shots you must have waited for. It's wonderful. I love looking at it. At this angle, all of the lines of the steps point right to the runner. A wonderful shot. Ohh,, I like the perspective.. it is wonderful. Where can we find the interview ?